Inspiration comes anywhere anytime, and for me, mostly when I’m traveling. When I see an interesting landscape I pull out the camera and shoot away. Sometimes I can incorporate an idea into what I’m working on at the time, or I might file it away for future jobs. In this case, while visiting my newly engaged niece in Memphis, I was able to implement this diamond idea right away. My niece loved the look as much as I did (could it be we have a wedding on our minds? ), so we put it to work on the fence enclosing her tiny patio. 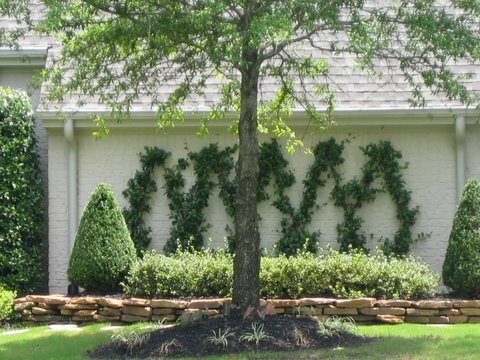 Although there was not enough space to get all the layers that are in this photo, we were able to take the theme and create a diamond shaped espalier on her wooden fence. It looks different from this photograph- and that’s what is fun about inspiration. No two ideas are exactly the same. On the morning we were leaving for Pensacola, we measured and marked the spots for the nails to create the pattern. My sister and I gave our hugs and kisses and said our goodbyes, as my niece headed for the hardware store to get the supplies. She called later that day, after her last plant was in the ground and wrapped around the wire to start it’s journey. She was excited to have accomplished a project to beautify her corner of the world. Besides loving relationships, creating beauty in our lives instills true happiness in everyone.